Raise the boiling point of your coolant for increased cooling efficiency and prevention of over heating with the Cusco High Pressure Radiator Cap. Utilizing a reinforced main pressure valve spring and silicon seals, the internal pressure of the radiator is increased, resulting in a higher boiling point. When coolant boils, small air pockets are created. As the coolant passes through the block and radiator core, the air pockets reduce the cooling efficiency and will eventually cause the engine to overheat. 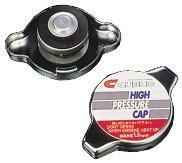 Cusco’s High Pressure Radiator Cap operates at 1.3kg/cm2 at zero atmospheric pressure. In theory, the atmospheric pressure of the road surface (approximately 1.0kg/cm2) is added and the pressure is 2.3kg/cm2.